Bankers and lawyers are enjoying a considerable bounty from the two huge pending insurance mergers, while regulators are still deciding whether to let them happen. 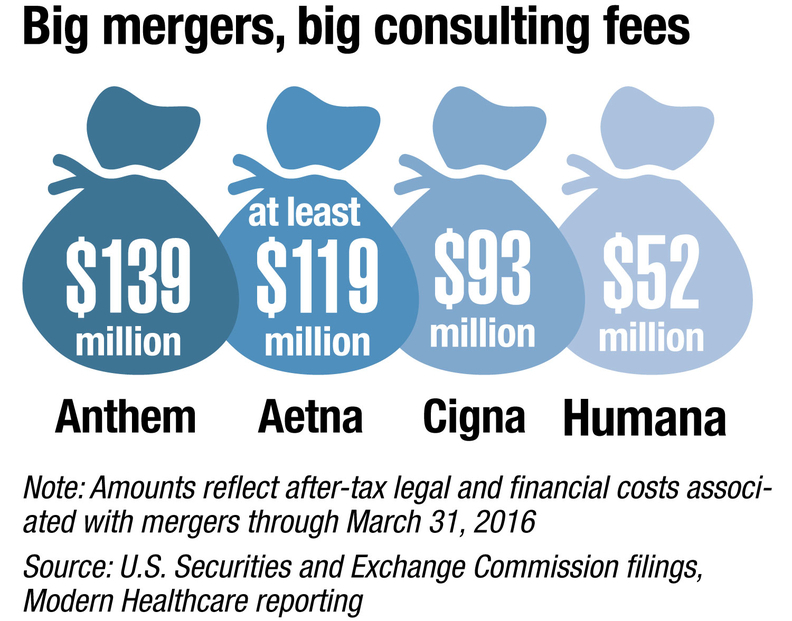 Aetna, Anthem, Cigna Corp. and Humana cumulatively have spent more than $400 million on armies of advisers who have crafted and advocated for their respective mega-mergers. That money reflects after-tax expenses from the time the deals were announced last summer through March 31. Last July, Aetna agreed to buy Humana in a $37 billion deal to bolster its Medicare Advantage business. Weeks later, Anthem and Cigna agreed on a transaction currently valued at $53 billion that would predominantly consolidate employer health-plan options. Deals of that size come with hefty transaction costs. “Bankers and attorneys charge a pretty penny,” said Jeffrey Loo, an equity analyst at S&P Capital IQ. Anthem has spent $139 million after taxes on legal fees, financial consulting and bridge-loan financing costs in its bid to complete the Cigna acquisition, according to an analysis of its financial records. Aetna has spent at least $119 million after taxes on its Humana transaction. Cigna and Humana paid lawyers and bankers $93 million and $52 million, respectively, on an after-tax basis for their transactions. The banks and corporate law firms that have been hired to vet the deals span a catalog of companies. Aetna's financial advisers have been Citigroup and Lazard, while it hired Davis Polk & Wardwell as its legal counsel. Goldman Sachs Group has acted as Humana's financial adviser (Brian Kane, Humana's chief financial offi¬cer, used to work at Goldman Sachs), and Fried, Frank, Harris, Shriver & Jacobson has served as its legal team. Anthem's hired financial guns include UBS Investment Bank and Credit Suisse, and the insurer tapped White & Case as its legal adviser. Cigna's banking and legal advisers are Morgan Stanley and Cravath, Swaine & Moore, respectively. The final tallies of transaction costs will depend on when or if the deals are approved. Cigna recently said “the complexity of the regulatory process” could push back an approval until 2017—after the presidential election.